This weekend in McMinnville is one of the greatest weekends in a wine lover's life. The International Pinot Noir Celebration sets up shop at Linfield College and pretty much completes the circle of life as it's outlined in that Disney song by Elton John. The food, Pinot, people, Pinot and lively conversation that Gwynne and I experienced last year leaves it tops on my list for wine tasting experiences. In addition to all the happenings at Linfield nearby McMinnville, and by nearby we mean like 100 yards to the left is hopping. That's where we met and had a great time with Rob and Maria Stuart of R. Stuart & Co. 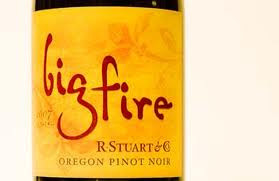 They make a bevy of beautiful single vineyard Pinot Noirs, what I think may be one of Oregon's most interesting wines in the Vin Tardive and today's Friday Find, their Big Fire Pinot. The 2009 version is the current release but there's still some 2008 floating around out there as well. This wine is comprised of a handful of vineyards that includes fruit from Temperance Hill and Erath among others. At the $16-18 price point (usually) it's a great affordable way to experience the potential of Oregon Pinot. Rob Stuart makes amazing wines in his upper tier and this wallet friendly Pinot gives you a snapshot of that. Cherries and violets and hints of nutmeg in the aromatics lead to some classically Oregon earthen characters, more fresh red fruit and a rounded, full Pinot experience (2008 vintage). This wine has very broad distribution and can be found at grocers and wine shops throughout the Northwest and select US markets.